the atmosphere. 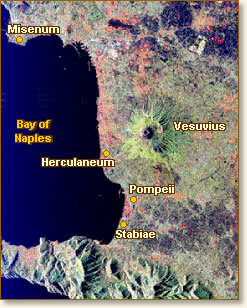 A "firestorm" of poisonous vapors and molten debris engulfed the surrounding area suffocating the inhabitants of the neighboring Roman resort cities of Pompeii, Herculaneum and Stabiae. Tons of falling debris filled the streets until nothing remained to be seen of the once thriving communities. The cities remained buried and undiscovered for almost 1700 years until excavation began in 1748. These excavations continue today and provide insight into life during the Roman Empire. An ancient voice reaches out from the past to tell us of the disaster. This voice belongs to Pliny the Younger whose letters describe his experience during the eruption while he was staying in the home of his Uncle, Pliny the Elder. The elder Pliny was an official in the Roman Court, in charge of the fleet in the area of the Bay of Naples and a naturalist. 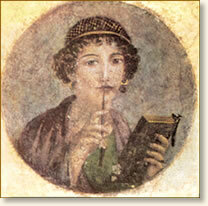 Pliny the Younger's letters were discovered in the 16th century. "My uncle was stationed at Misenum, in active command of the fleet. On 24 August, in the early afternoon, my mother drew his attention to a cloud of unusual size and appearance. He had been out in the sun, had taken a cold bath, and lunched while lying down, and was then working at his books. He called for his shoes and climbed up to a place which would give him the best view of the phenomenon. 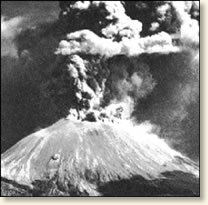 It was not clear at that distance from which mountain the cloud was rising (it was afterwards known to be Vesuvius); its general appearance can best be expressed as being like an umbrella pine, for it rose to a great height on a sort of trunk and then split off into branches, I imagine because it was thrust upwards by the first blast and then left unsupported as the pressure subsided, or else it was borne down by its own weight so that it spread out and gradually dispersed. In places it looked white, elsewhere blotched and dirty, according to the amount of soil and ashes it carried with it. As he was leaving the house he was handed a message from Rectina, wife of Tascus whose house was at the foot of the mountain, so that escape was impossible except by boat. She was terrified by the danger threatening her and implored him to rescue her from her fate. He changed his plans, and what he had begun in a spirit of inquiry he completed as a hero. He gave orders for the warships to be launched and went on board himself with the intention of bringing help to many more people besides Rectina, for this lovely stretch of coast was thickly populated. He hurried to the place which everyone else was hastily leaving, steering his course straight for the danger zone. He was entirely fearless, describing each new movement and phase of the portent to be noted down exactly as he observed them. Ashes were already falling, hotter and thicker as the ships drew near, followed by bits of pumice and blackened stones, charred and cracked by the flames: then suddenly they were in shallow water, and the shore was blocked by the debris from the mountain. For a moment my uncle wondered whether to turn back, but when the helmsman advised this he refused, telling him that Fortune stood by the courageous and they must make for Pomponianus at Stabiae. He was cut off there by the breadth of the bay (for the shore gradually curves round a basin filled by the sea) so that he was not as yet in danger, though it was clear that this would come nearer as it spread. Pomponianus had therefore already put his belongings on board ship, intending to escape if the contrary wind fell. This wind was of course full in my uncle's favour, and he was able to bring his ship in. He embraced his terrified friend, cheered and encouraged him, and thinking he could calm his fears by showing his own composure, gave orders that he was to be carried to the bathroom. After his bath he lay down and dined; he was quite cheerful, or at any rate he pretended he was, which was no less courageous. Then the flames and smell of sulphur which gave warning of the approaching fire drove the others to take flight and roused him to stand up. He stood leaning on two slaves and then suddenly collapsed, I imagine because the dense, fumes choked his breathing by blocking his windpipe which was constitutionally weak and narrow and often inflamed. When daylight returned on the 26th - two days after the last day he had been seen - his body was found intact and uninjured, still fully clothed and looking more like sleep than death. Ashes were already falling, not as yet very thickly. I looked round: a dense black cloud was coming up behind us, spreading over the earth like a flood. 'Let us leave the road while we can still see,'I said,'or we shall be knocked down and trampled underfoot in the dark by the crowd behind. 'We had scarcely sat down to rest when darkness fell, not the dark of a moonless or cloudy night, but as if the lamp had been put out in a closed room. There were people, too, who added to the real perils by inventing fictitious dangers: some reported that part of Misenum had collapsed or another part was on fire, and though their tales were false they found others to believe them. A gleam of light returned, but we took this to be a warning of the approaching flames rather than daylight. However, the flames remained some distance off; then darkness came on once more and ashes began to fall again, this time in heavy showers. We rose from time to time and shook them off, otherwise we should have been buried and crushed beneath their weight. I could boast that not a groan or cry of fear escaped me in these perils, but I admit that I derived some poor consolation in my mortal lot from the belief that the whole world was dying with me and I with it." Allen, G.B. (editor), Selected Letters of Pliny, (1915); Maiuri, Amedeo, Pompeian Wall Paintings (1960); Radice, Betty (translator), The Letters of The Younger Pliny (1969). "The Destruction of Pompeii, 79 AD," EyeWitness to History, www.eyewitnesstohistory.com (1999). At the time of its destruction, Pompeii is estimated to have had a population of 20,000. Pliny became a lawyer at age 19 and did quite well. He owned a number of villas in Northern Italy and Rome. Pliny became a confidant of the Emperor Trajan and was made Governor of Bithynia in what is now Turkey. Pliny died there in 113 at the age of 52 or 53.